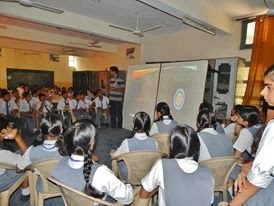 A presentation on was shown by the members of Environment Cell, NSS, IIT Roorkee to the children of Kendriya Vidyalaya on 24th October 2013 .The timing of this event was from 7.3o am to 8.30 am. The members of Environment Cell as well as Kendriya Vidyalaya students attended the event. This venue of the event was Kendriya Vidyalaya itself. During the presentation, children were told about different types of pollution such as land pollution, water pollution, air pollution and noise pollution. This presentation was well received by students who were both enthusiastic and energetic. Students were told to turn off taps when not in use, turn lights and fans off when they left the room etc., as a means of saving electricity and water. They were also encouraged to use jute bags instead of polythene bags for shopping as polythene bags causes many problems and are not environment-friendly. Children were told that they are the future of the country and the prime responsibility of moulding the country lies on their shoulder and as such, have to keep their country clean. Finally, the students were asked what they would do to save the environment if any of them becomes the Prime Minister of the country. Many children came forward and gave their views and told that they would ban hunting, plant more trees etc. Then, the event was concluded and the members of NSS Environment cell thanked the teachers for giving them such an opportunity and the students for their enthusiastic participation.